The Green Bank Telescope in West Virginia. The 330-foot-wide (100 meters) radio dish is searching for possible signals from intelligent aliens as part of the $100 million Breakthrough Listen project. STANFORD, Calif. — A $100 million search for intelligent aliens has come up with some intriguing leads but has revealed no evidence of E.T. so far. 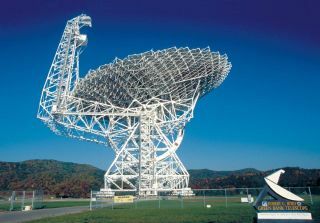 Observations of nearly 700 stars by the Green Bank Telescope (GBT) in West Virginia revealed no compelling signs of alien civilizations, representatives of the Breakthrough Listen project, which led the observations for the E.T. search, announced Thursday (April 20). "We were able to determine that they were most likely due to radio frequency interference," Andrew Siemion, director of the University of California, Berkeley's SETI (Search for Extraterrestrial Intelligence) Research Center, said here Thursday during a presentation at the Breakthrough Discuss conference. The new results are just the beginning for Breakthrough Listen, which billionaire entrepreneur Yuri Milner and a group of scientists, including Stephen Hawking, announced in July 2015. Over the next decade, the ambitious project aims to search the 1 million stars closest to the sun, the 100 galaxies closest to our own Milky Way, and the galactic plane for possible signals of intelligent extraterrestrial life. Breakthrough Listen scientists are starting with an initial target list of 1,709 stars, which the team is observing with three telescopes: the 330-foot (100 meters) GBT radio dish, the 210-foot-wide (64 m) Parkes radio telescope in Australia and the Automated Planet Finder, a 7.9-foot (2.4 m) optical telescope at the Lick Observatory in California. "This sample of stars is designed to be what we call 'spectral type complete' — it samples stars of every spectral type," Siemion said. "We want to look at as many different types of stars as possible, to leave ourselves open to any possibility that life might emerge [around] one of these stars." The newly announced results, which the team submitted to The Astrophysical Journal on Thursday, are based on GBT data for 692 of those 1,709 stars. The telescope made about 5,000 individual 5-minute observations, racking up a total of 400 observing hours, Siemion said. Those observations targeted a band of frequencies that includes the "water hole," a quiet part of the radio spectrum that SETI scientists have long speculated would be a good window for interstellar communication. The water hole lies between the emission band of hydroxyl molecules (OH) and that of hydrogen. Together, hydroxyl and hydrogen form water — hence the name. "These results represent the most comprehensive and fundamental test of the water-hole hypothesis that's ever been conducted for nearby stars," Siemion said. "This is a classic idea in the search for extraterrestrial intelligence that's been with us for more than four decades." Breakthrough Listen is part of the Breakthrough Initiatives, which Milner founded in 2015 to look for evidence of life beyond Earth and help spur space exploration. Another program under this umbrella is Breakthrough Starshot, which aims to develop a system that can blast tiny, sail-equipped nanoprobes to other star systems at 20 percent the speed of light using powerful lasers.